Gore Gazette - No 107, August 1992: Yup. The old pillar shot on the cover of this New York listings and comment fanzine. Gore Noir - No 10, Fall 2013: An issue packed with features to celebrate the 25th anniversary of Hellbound includes interviews with Doug Bradley, Simon Bamford, Nick Vince and Barbie Wilde as well as with Max Lichtor from the Pyramid Gallery. Cover art by Christopher Ott. Gorezone - No 22, 1992: The sole cover appearance for CD Head heralds a magazine with an excellent Peter Atkins interview. Hellbreed - No 1, May 1995: Despite Pinhead's best efforts on issues one and two, this UK Barker-specific magazine folded after just three issues in 1995. It launched with an interview with Barker. 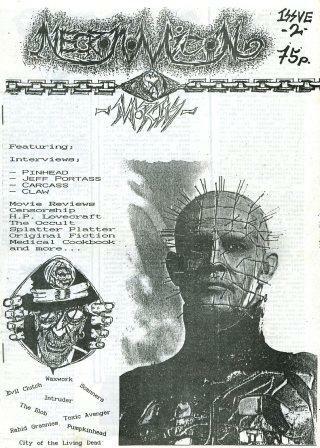 Hellbreed - No 2, June 1995: Pinhead again, this time with the first of a two part interview with Doug Bradley. 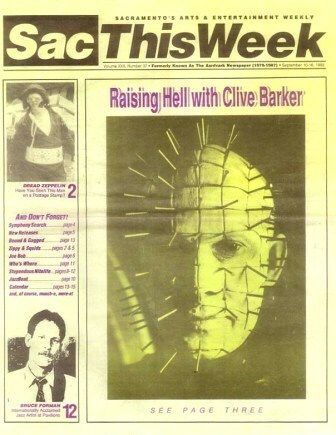 Hellraiser - No 1, 1990: The first issue of the UK's "Clive Barker Fan Club" contained interviews with Barker and Doug Bradley. 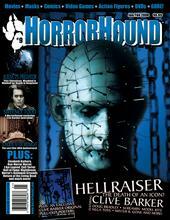 HorrorHound - No 9, January/February 2008: Featuring an extensive 14-page overview of the Hellraiser films, props and merchandise, a page on Nightbreed and a pull-out poster of Clive's painting, The Twilight Dancers! 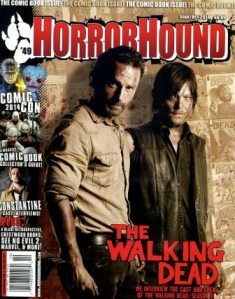 HorrorHound - No 49, September/October 2014: Pinhead's top left, alongside Funko's interpretation of Metaluna Mutant, as HorrorHound rounds up the best of Comic-Con 2014 and toy news. The Horror Newsletter - No 3, January 2006: Featuring an excellent interview with Hellbound's female cenobite, Barbie Wilde. Impact - No 14, April 1988: A Hellbound set visit by this French magazine includes interviews with Barker and others. In The Flesh - No 1, 1989: Browning's razor blade love-fest gets a front cover slot of issue one of this UK horror magazine. Kino Domowe - No 1/2004, 2004: This magazine accompanied a DVD release of the first Hellraiser movie in Poland. 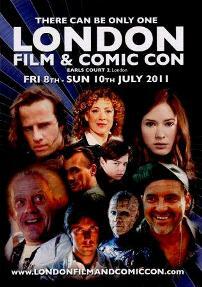 London Film and Comic Con - 8-10 July 2011: Pinhead adds a headshot to this brochure showing a few of the collection of attendees at the London Film and Comic Con. Lost Souls - Newsletter, May 2000: Scott Stoner's illustration 'Boxscratch' graced the cover of Deborah Gordon's first Lost Souls newsletter which contained an old 1992 Barker interview as well as a brand new interview with him, both by Cody Goodfellow. Lost Souls - Newsletter, July/August 2000: For the next issue, Pinhead was back, reasserting his authority. Contains a transcript of the 2000 Festival of Books Q&A. 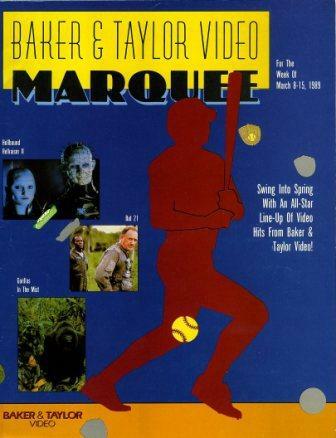 Marquee - 8-15 March 1989: Pinhead and the Female Cenobite share billing with Gene Hackman, Danny Glover and Sigourney Weaver on Baker and Taylor's weekly video magazine as Hellbound heads for its VHS release. Marvel Requirer - Vol 1 No 20, October 1991: The impending release of Clive Barker's Jihad earned Pinhead the cover spot on this listing of Marvel's upcoming releases. The Middlesex News - 2-8 October 1987: The MetroWest Extra section of The Middlesex News placed "A cenobite creature" on the cover with an interview with Clive on pages 2 and 3 alongside a movie review. 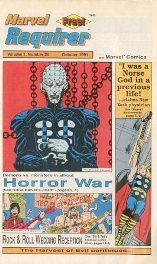 Midweek - 10 December 1992: Pinhead gets a small black and white shot as compared to his creator's full colour cover status. Contains a Barker interview. Miramax / Dimension - 1996: The movie studios' promotional booklet that showcased their upcoming features had Pinhead in the exalted company of de Niro, Streep, Fiennes, Depp, Paltrow... need we go on? 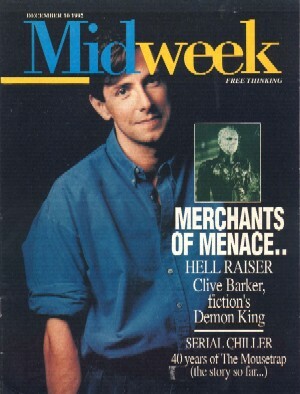 Monstroid - No 3, Spring 1993: Whoever took this photo should have had a profit-share every time it was used... Peter Atkins discusses Hellraiser III and his novel, Morningstar. Moviestar - June 1989: Hellbound gets the German cover treatment from Moviestar. Necronomicon X Mortis - No 2, 1989: Staring imperiously from the cover of this fanzine, Pinhead invites us to sample the delights of interviews with Geoff Portass and Doug Bradley inside. 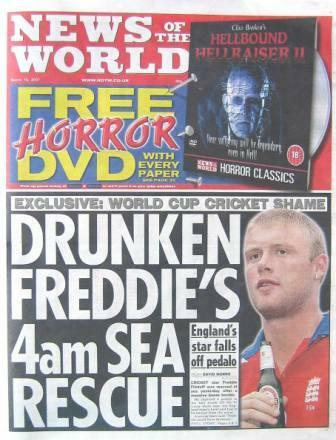 News of the World - 18 March 2007: A free copy of Hellbound on DVD with this UK Sunday tabloid results in a cover shot for Pinhead. 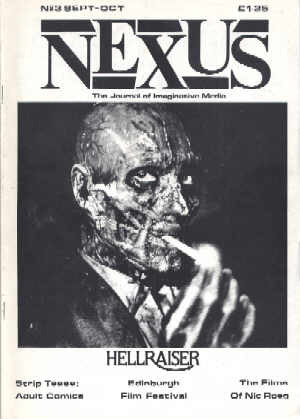 Nexus - No 3, September/October 1987: Making use of the Frank still favoured by Shock Xpress earlier the same year, Nexus herald their Hellraiser review with the cover slot. 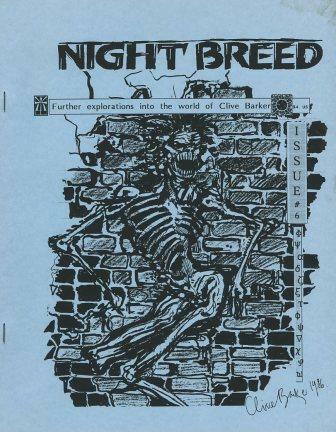 Nightbreed - No 6, July 1992: The Clive Barker Appreciation Society's magazine featuring a mix of news and fan art and fiction had Clive's sketch of Frank on the cover of issue 6. Nightbreed - No 9, April 1993: Three issues later, Doc gets cover billing as the CBAS reprints a 1980s radio interview with Clive. Other Dimensions - No 1, Summer 1993: Contains an interview with Clive. Rassegna Del Cinema Horror - 1995: This Italian Hobby Work magazine features Hellraiser III on the cover and examines the movie as well as Clive's work in comics inside. 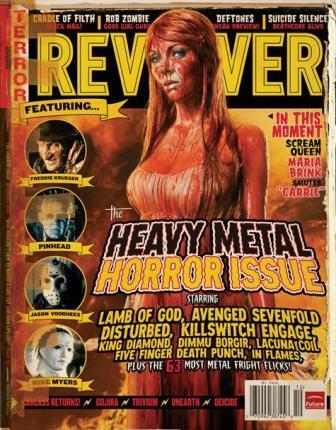 Revolver - December 2008: Pinhead joins Freddy, Jason and Michael as Revolver charts its favourite horror films for Halloween 2008. 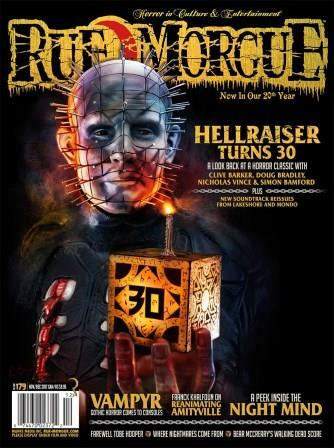 Rue Morgue, No 179, November / December 2017: Rue Morgue celebrates 30 years of Hellraiser with interviews with Clive and the cenobites. 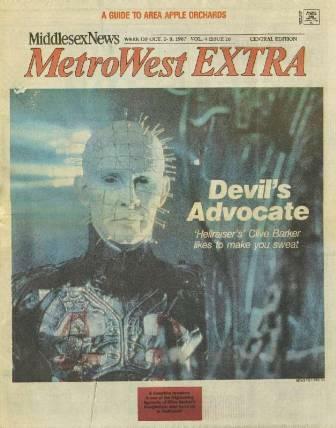 Sac This Week, 10 - 16 September 1992: Sacramento's Arts and Entertainment weekly conducts an interview with Clive as Hellraiser III is about to be unleashed. Samhain - No 8, March/April 1988 (cover A): A location visit to the Hellbound set includes interviews with Clive, Tony Randel and others. Samhain - No 8, March/April 1988 (cover B): For some reason we've never worked out, there were two covers for this issue with John Carpenter's Prince Of Darkness fighting Hellbound for top billing. Channard wins, the Engineer loses. Fair enough. 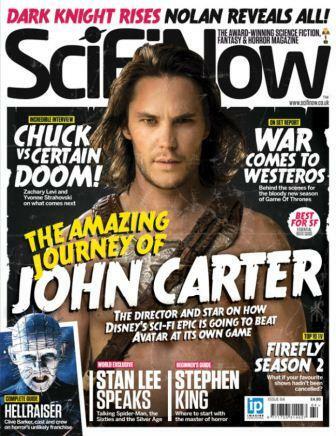 SciFiNow, No 64, March 2012: An overview of the Hellraiser series has interviews with cast and crew, including a 2009 interview with Clive. 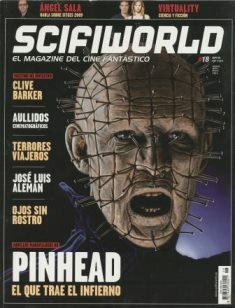 SciFiWorld, No 18, September 2009: Cover billing for Pinhead as this Spanish magazine devotes no less than 14 pages to an overview of Clive's work and a further 8 to the Hellraiser series. 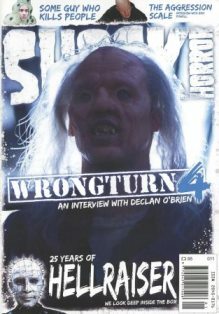 Scream - No 5, May 2011: Doug Bradley's interview takes centre stage in this UK magazine. Scream - No 19, June/July 2013: ...and Simon Bamford. 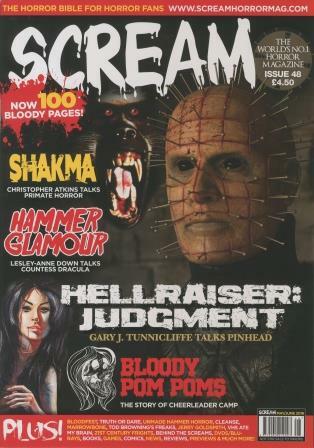 Scream - No 48, May/June 2018: Interview with Gary Tunnicliffe to celebrate the release of Hellraiser Judgment. 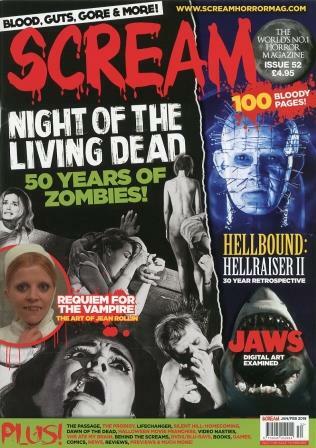 Scream - No 52, January/February 2019: A retrospective, looking at Hellbound on its 30th anniversary. 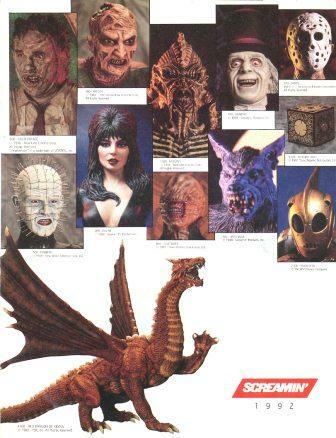 Screamin' - 1992 Catalogue: Pinhead, Chatterer and the puzzlebox all feature on the cover of Screamin's 1992 catalogue of available models as the first three Hellraiser models are released. 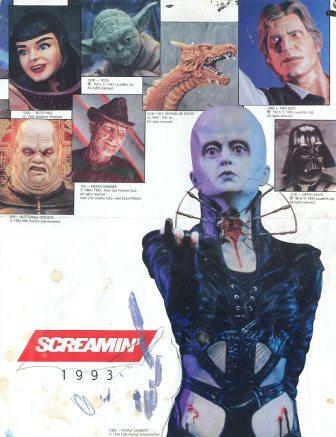 Screamin' - 1993 Catalogue: The following year, the addition of Butterball and the big cover star - Female Cenobite - to the line has these two on the cover and the whole gang of five models gets a two page spread inside. 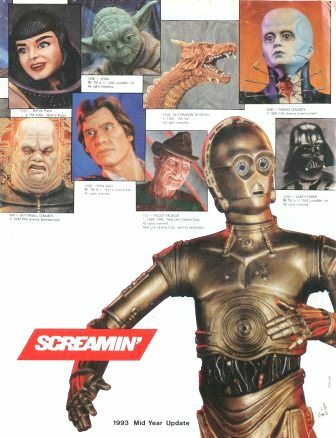 Screamin' - 1993 Mid-Year Update Catalogue: C-3PO pushes Female Cenobite up into a smaller photo slot in 1993's mid-year update. 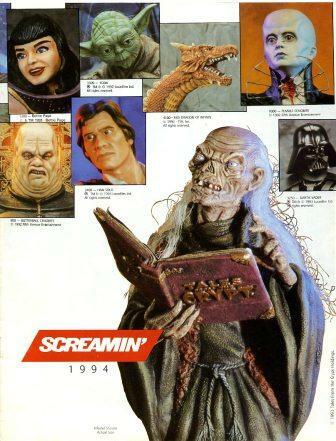 Screamin' - 1994 Catalogue: For 1994's full catalogue, the Crypt Keeper has replaced C-3PO but Butterball and Female Cenobite keep their place in the spotlight. 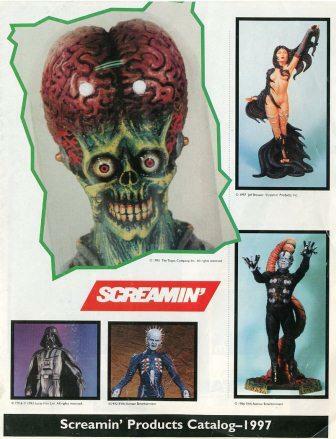 Screamin' - 1997 Catalogue: By 1997, it's Pinhead back on the front cover, this time accompanied by Dr. Channard's model. 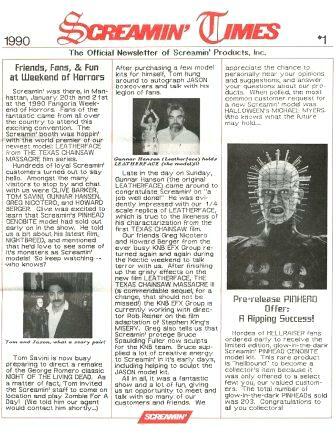 Screamin' Times - No 1, 1990: News of the 203-copy release of the glow-in-the-dark Pinhead kit was included on the front page of Screamin's first official newsletter. Shadow Demons - No 3, 1992: We don't have this (can anyone help?) but we understand it's got part one of a Doug Bradley interview. Shadow Demons - No 5, 1992: We don't have this one either. There's the final part of the Doug Bradley interview inside. Shivers - No 1, June 1992: Umm... Always best to launch a new magazine with the best image available... Doug Bradley discusses Hellraiser III. Shivers - No 20, August 1995: Pinhead and the Proteus beast feature as Bob Keen steps forward to be interviewed as director of Proteus. Shivers - No 50, February 1998: Fabulous company Pinhead's keeping here - including Peloquin and Candyman - but that's got to be the scariest shot we've ever seen of Stephen King in the middle of the back row... Features part one of a Hellraiser IV 'script-to-screen' essay. Shivers - No 51, March 1998: You really need yet another Buffy magazine, Phil? - Oh, sorry, yes if you really squint hard you can just about see Angelique in the top right hand corner as the concluding part of the Hellraiser IV script-to-screen article appears. Shivers - No 53, May 1998: Two issues later, Peter Atkins pens a response to the script-to-screen article. So this time maybe he gets his face on the cover? Well nearly, but not quite... Barbie cenobite appears top left. 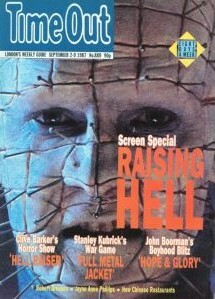 Shock Horror - No 11, 2012: A 25th anniversary look back at Hellraiser earns Pinhead cover status. Shock Xpress - No 6, Spring 1987: An interview with Clive conducted during a location visit to the Hellraiser set. Shock Xpress - Vol 2 No 3, Spring 1988: A set visit to Hellbound includes interviews with Clive, Tony Randel and others. Sins Of The Flesh - April 2002: The launch issue of a UK horror fanzine that includes an essay on the sexual delights of the Cenobites. Speakeasy - No 102, September 1989: The use of John Bolton's peerless artwork again works to perfection. Contains an interview with Barker. Starburst - No 122, October 1988: Reporting a panel discussion/interview on censorship. TerrorZone - No 3, May/June 1992: A great cover on this Australian magazine. Just a very short article on Hellraiser III inside. Texas Frightmare Weekend Programme 29 April - 1 May 2011: Pinhead takes centre stage among a veritable pantheon of horror icons for the programme of April/May 2011's Texas Frightmare Weekend in Dallas. That's Clive! 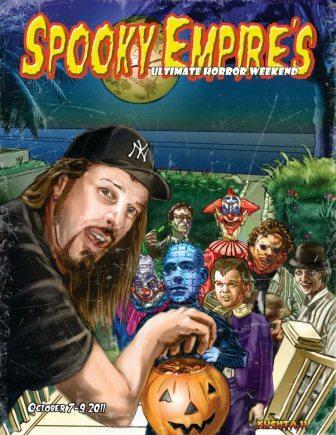 - No 0: The German Clive Barker fanclub's inaugral publication has Pinhead watching over Barker's shoulder. That's Clive! - No 3: Pinhead's pins are transferred over to the visage of his maker for this Hellraiser special. 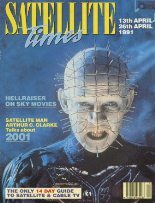 Time Out - No 889, 2-9 September 1987: The UK release of Hellraiser is celebrated by Pinhead taking centre stage in London's weekly listings guide. An interview with Clive is inside. TIP, No 5, 18 February to 2 March 1988: TIP, the Berlin Magazine, gives their cover slot over to Clive and Doug and there's an interview with Clive inside. 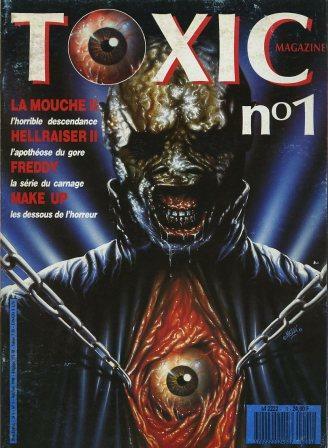 Toxic, No 1, April 1989: A painting by Laurent Melki of Chatterer was commissioned by L'Ecran Fantastique for the debut issue of their spin-off magazine, Toxic, which featured an interview with Tony Randel. 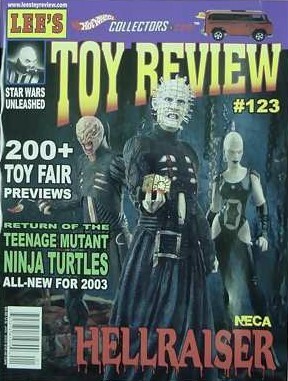 Toy Review - No 123, January 2003: NECA's Chatterer and a Twin share top billing with Pinhead as the first figures from their Hellraiser licence get a cover shot. 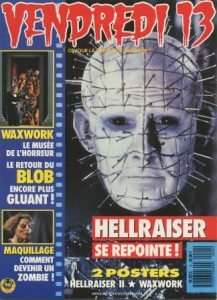 Vendredi 13, No 4, October 1988: Announcing the return of Hellraiser as Hellbound arrives in French cinemas. 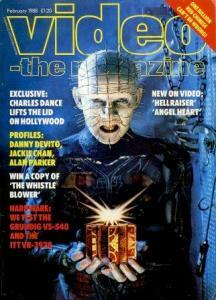 Video - The Magazine - February 1988: Newly released on VHS, Pinhead takes the full cover slot. 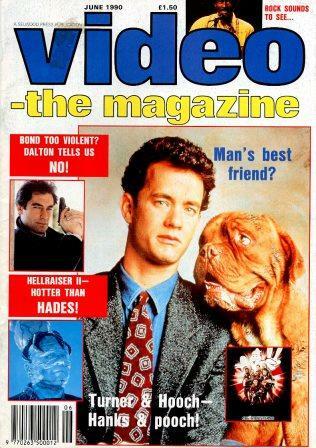 Video - The Magazine - June 1990: Channard announces a competition to visit Image Animation as Hellbound emerges on UK VHS. 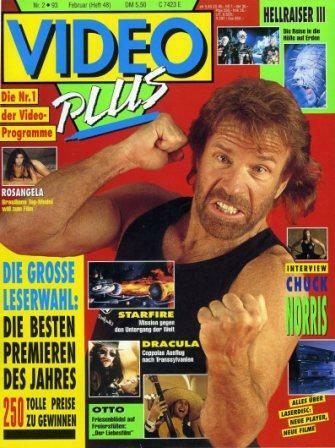 Video Plus - February 1993: Pinhead screams (again) while Camerahead, CD and Barbie lurk above Chuck Norris on the cover of this German film magazine. Video Woche - No 43, 21-27 October 1996: Germany's video industry magazine puts a red-eyed Pinhead on the cover. 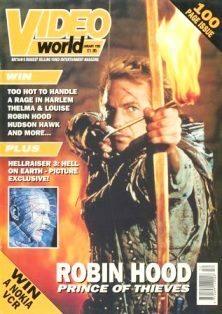 Video World - February 1988: Pinhead on the cover, yes there on the left - concentrate on the left... Andrew Robinson is interviewed inside. Video World - January 1992: Several Hellraiser III photos were released early to accompany a feature on the making of the movie. 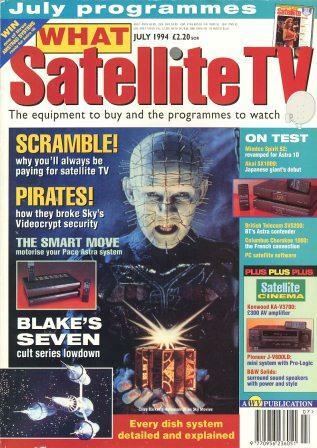 Video World - July 1993: Now Phil insists the only reason he needs to study this magazine in detail is because of the Doug Bradley interview inside - is he fooling anyone? 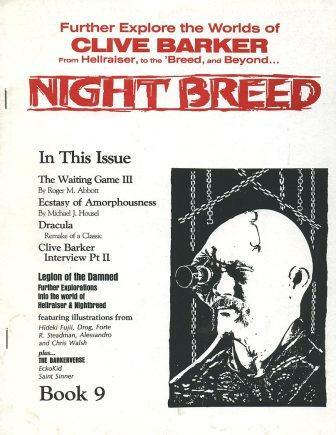 Video World - April 1995: Although Pinhead get his photo on the cover (just), it's the masks in Hellbound and Nightbreed that are examined as part of a feature on cinematic masks inside. World Of Fandom - Vol 2 No 15, Spring 1992: Kirk Reinert's cover illustration for the Hellbound Heart looks even better full size as a magazine cover. This Clive Barker issue features interviews with Clive, Bob Keen, Peter Atkins, Doug Bradley, Anthony Hickox, Michael Brown (Pandemonium) and Stephen Jones (Shadows In Eden). Fabulous stuff! X-Rated - No 23, 1st Quarter 2003: This German magazine features a rare outing for Hellseeker as its cover star to accompany a review inside.